This document covers the ins and outs for department purchases of Multi-function Devices (Ricoh). The campus has standardized on Ricoh MFD devices. 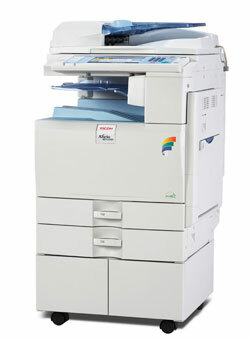 MFD's allow printing, scanning, and copying with the option to fax. Often one MFD can replace several printers and scanner resulting in reduced energy consumption and lower cost of ownership. There are models available based on department volume. Please contact Karen Peterson in Purchasing x2693 or Helen Alexander x2516 in CIT to schedule an office technology review in your area. UW-Green Bay is "Going Green" by using Network Printers & Multi-function Devices. UW-Green Bay has newly defined standards and criteria to use when evaluating printing options. CIT and Purchasing would appreciate the opportunity to share our findings and help you save money, achieve the best functionality, improve efficiency, and help meet campus sustainability goals. Please contact Karen Peterson (x2693) for an office technology review of your area! MFD's offer networked printing, copying, duplex, scan to email, collating, stapling, print and hold functions, optional color print and fax features. MFD's cost/page includes the equipment, maintenance, toner, staples and paper. The environmental impact of MFD's is significantly lower than that of printers. Lower energy and toner use equals lower CO2 emissions. Your department can pool area printer volume to an average of 3,000 or more pages/month. You can include your color prints in the pool now that color MFD’s are available. Distance to a networked printer or MFD is farther than 20 steps from your office. You regularly work off hours with no printer or MFD (copier) access. All across the U.S., printer consolidation has been found to save money by reducing the number of devices in printer fleets, and by ensuring that the remaining devices are more cost effective to own and operate. Strategies include the elimination of inkjet or other high-cost printers, the sharing of workgroup printers, and the use of multi-function devices (MFD’s) instead of individual printers, copiers, fax machines, and scanners. Benefits include lower costs for hardware, consumables (paper, ink, and toner), electricity, and maintenance. I’m concerned about the environment, but I am also concerned about our budget. Will this cost us more? It shouldn’t cost you more, but this depends on your area’s current equipment and usage. Cost information will be considered in the assessment so you may make an informed decision. What if our MFD is not working properly and we need to print? You should always have an alternate available for printing. Networked central printers and MFD’s can be mapped so that you may route your prints to at least two devices. What if we have problems with our printer? What if we have problems with our MFD? Performance Up-time Guarantee of at least 95% during every calendar month. I do a lot of confidential printing and am concerned about confidentiality with a shared device. All of the networked MFD’s, along with some of the HP printers, offer the Print and Hold feature. This allows print jobs to be sent to the printer, but not actually printed until a user releases the job at the printer, with optional password, thus ensuring sensitive data stays secure. How can I reduce unwanted page printing and duplex? Set your printer to duplex by default if you have that option. You can switch to single-side as needed. Set color printers to print black by default. Again – color can be turned on via Printer Properties. How can I get help with selecting a Printer or an MFD for my area? Contact Helen Alexander x2516 who will guide you to purchasing a printer or will refer you to Karen Peterson x2693 to obtain an MFD. This will be based on your department's needs. When should I use the off campus DigiCOPY Copy Center? Digicopy provides a wide variety of services to support students, faculty and staff needs. Large print jobs, flyers, and posters are just some of the services that they offer. See the Purchasing website for more information. The higher the quantity, the more likely that it will be more cost effective to have the piece printed off-campus rather than using a Ricoh.